Iconic Italian armchairs attributed to Carlo di Carli. Reupholstered two-tone mohair and velvet. 1950s Italy. Brand new Upholstery and Legs have been refinished. 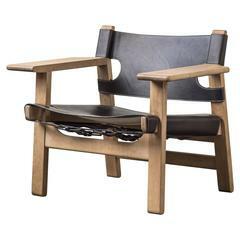 A rare example of Børge Mogensen's oak Spanish chair in black leather. Carlo di Carli lounge chair for M. Singer & Sons, 1950s. With new foam and black leather.